Howdy friends! Thanks for being here today. So, do you have routines that you do every morning to help your mind and body best prepare for the day ahead? I am a creature of habit; I love to wake up early (like 5 am early) when it's just Flora and Peep and me awake. I always have a cup of green tea, followed at some point by a light breakfast. By waking up at 5 am, I know that I have a good 2 hours before the rest of the house is awake…which in and of itself is very restorative to me. I usually get the dishwasher emptied from the night before and get my day planned. One of the ‘habits' that I have tried to develop over the years is to have a cup of hot water with ginger and lemon prior to drinking my tea. 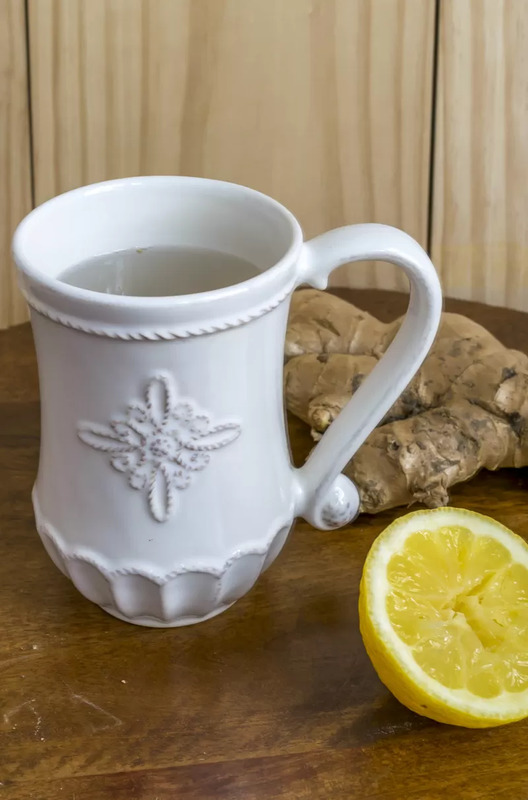 There are so many positive health benefits to this mixture; ginger is an excellent anti-inflammatory, anti-nausea and digestive aid and lemon not only gives you a great daily dose of vitamin C but also has anti-inflammatory and digestive benefits. But, if I'm perfectly honest, grating fresh ginger and squeezing lemons every morning for my Ginger Lemon Tea is just not something I'm going to regularly do, despite the fact that I know it makes me feel better. Enter my Ginger Lemon Tea cubes! I've been on a cubed food kick for a bit and this was another great candidate for the cubed treatment. By having the ingredients in a cube form, all I need to do each morning is pop one in my class of boiling water. It dissolves quickly and cools the water down to the point where, if I want, I could add some honey to further boost the drink (especially in the spring when I use local honey to help ward off seasonal allergies.) I don't mind the ginger pulp that is at the bottom of my cup, but if it bothers you, then make it in a measuring cup and simply strain it when you pour it into your teacup. To make my ginger lemon tea cubes, I grate ginger to make 1/4 of a cup. I then juice 4-5 lemons and add it to the ginger (I used some Meyer Lemon juice which caused the mixture to turn a lovely shade of peach) and then add water to make 2 cups of liquid. This will fill my 16 cube ice trays, 2 tablespoons for each cube. If you are looking to add a cup of hot ginger lemon tea to your morning routine, these ginger lemon ‘tea' cubes are the perfect solution. Hi Ruth! Thanks for coming by today. I have been going through my cubes at a very brisk pace lately, I need to get some more ginger as well. Today I made a cup of it, let it chill down and poured it over some ice cubes with some mint. So refreshing for a warmer day. We are so much alike! I love getting up early to have that special me time in peace and getting ahead of things and starting the day quietly. Except that I have a glass of lemon water, without the ginger, and after my cup of cappuccino. We always boil ginger and drink it as tea with honey, I had no idea to mix it with lemon and the cube idea is just brilliant! Perfect for early mornings! 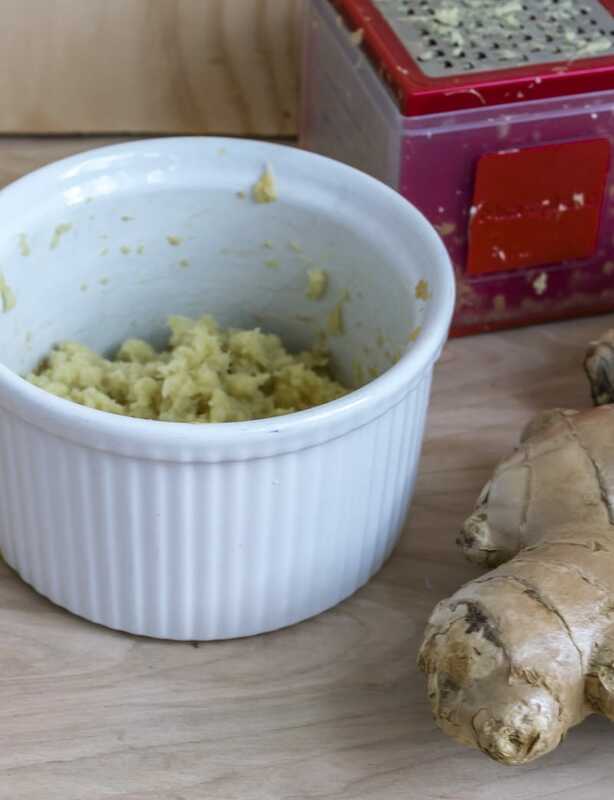 Do you think I could throw the ginger root in the nutribullet blender? I don’t have a grater, but I will get one tomorrow if it’s what I need for this! Love this and I love ginger! Thanks for another great tip Lynn! Happy Monday night! I take being similar to you quite a compliment…thanks! I am really not familiar with a nutribullet, but I’d surely go ahead and give it a try. Do you have zester? That’s probably more similar to what I used. The only thing I’d say is that with the nutribullet, you might have more fibers in your tea. That doesn’t bother me and I actually try to consume them as well. But do check back and let me know how the nutribullet works. I’m curious. Hi Lynn, so I tried and put the previously boiled ginger root in my nutri bullet, it’s like a blender… and it turned out quite intersting! Very strong, but really good! My hubby loves the idea as well! Thanks for sharing this great tip at Sweet Inspiration #6! So glad Katrin…is it stringy? When I tried it in my blender it was rather stringy…which didn’t bother me but might some people. Oh…and I didn’t boil the ginger before hand. Wonder how the boiled is different. Hi Wendi…just today I boiled some water, added a cube and when it cooled poured it over some ice and fresh mint. So refreshing. Think this may be my summertime drink. Clever idea using the cubes! Even if I wake up early I find it helpful to have all the prep work done for any morning activities or breakfast items. I’m with you Liz…don’t tax me too much in the morning. I also like to make my breakfast in advance, usually on Sunday, for the rest of the week. Don’t want to jump into the ‘busy’ any sooner than I have to. Good Evening Lynn! The ginger/lemon cubes sound like a wonderful taste & I am an avid tea drinker for all seasons! But, I am not an early riser! My kids are long out of the house. I am retired, but my husband still has a job & is gone whenever I wake up, which is usually not til after 10! (I have insomnia these days so usually up til at least 2! ~ any suggestions for that?!) …Going to the store 2morrow, I can’t wait to try this lovely tea! Thanx for the unique & easy recipe! Hi Becky…I am so sorry to hear about your insomia…I’ll tell you my secret to combat insomnia…but you need to have an open mind. There is a podcast called “Sleep With Me”. The podcaster really just drones on about nonsense, or he drones on while reading articles. I really struggled with insomnia, but now when I wake up, I put this podcast on and it really works! But a warning…it’s a little odd and there has been some ‘language’ that I didn’t anticipate. But most of the time I’m sleeping so I don’t pay attention to it. My favorite episodes, which I just play over and over, are his ‘Game of Drones’, a review of the show ‘Game of Thrones’. Just for what it’s worth. As it relates to my ginger/lemon cubes…they are proving to be one of my favorite brainstorms. Getting ready to make another batch..May add mint this time. Good luck with your sleep. I love the cube idea, it would make it so much easier for those early morning. Work days I’m up at 1:30, and on my days off I’m usually up by 4:00-4:30. This sounds like a great way to start the day. Sometimes I wake with a upset stomach so the ginger would help that. I bought some lemon today now I need to go get some ginger. Thank you for sharing, I’m going to try your cubes. Linda…what the heck? You wake up at 1:30 am? I’m curious what your ‘day job’ is that you need to wake up so early. In any event, this cubes are the way to go for then. Boil your water, grab a cube and you have a healthy way to wake up your body each morning. Stop back and let me know if you love cubes as much as I do. Hi Lynn! Yes 1:30 am. I work at the DFW airport. I have an hour commute one way, then have to catch a bus from employee parking to take to the terminals. I made your ginger cubes but this morning I think I poured in to much water, it was a little weak. Other then that it was good. Tomorrow I’ll use less water. Have a great weekend! Wow Linda…crazy schedule. I don’t know how you have time for all your ‘kreations!’ Anyway, you just reminded me that I probably need to add to my post that my teacup is about 2 cups, so I use one cube for 2 cups of hot water. I guess it is a matter of taste how strong you like your ‘tea’, maybe 2 cubes next time? I think I probably added about two cups, but this morning I used one cup per 1 cube, and I liked that much better. Guess I like it a little stronger. Lynn, I am so impressed with your healthy routine. I drink sweet iced tea all day ~ Southern girl that I am. I wish I could be more disciplined. Thank you for sharing at Your Inspired Design. Oh yes…I”m in sweet tea land here in North Carolina too. Haven’t fallen into that habit, but do love my green tea…and my ginger lemon tea. I’ve been making it with mint lately…perfect over ice for the warmer months. I never would have thought of making this up into cubes! You make it sound so simple to put together, and I love the idea that it’s all ready to go whenever I need or want it. Thank you for such a wonderful suggestion! Hi Melanie…the cubes are the BOMB! they make everything so much easier in the morning. I’v been pouring the ‘tea’ over ice cubes and mint now that it is getting warmer…really delicious. Hope you gie them a try and enjoy them as much as I do. I love ginger in hot water, but I don’t have it very often due to the grating of the ginger for each cup! This is brilliant! You are definitely the go to for figuring out how to have something stored for easier use, and these cubes are the best idea, ever. So many things that I need to prepare and freeze, I love all of your ideas. Especially this one and frozen herbs. This summer I am going to utilize your fabulous ideas when harvesting the garden. Thanks so much for sharing this, I had never seen this talked about before. And it’s a great way to use the garden produce or have a healthy cup of ginger tea! Hey there friend, these ginger lemon cubes are the greatest! I just used up my last one this morning, so need to get in cube making mode ASAP! I have been adding to some ice cubes and chopped mint…makes a lovely refreshing drink for these warmer months as well. I LOVE this idea. I drink a concoction of lemon juice, apple cider vinegar and honey. It really would be beneficial to have it all in cube form! Hi Laura, I have heard about the benefit of drinking cider vinegar and honey, but I haven’t really tried it yet. I would think you could freeze the lemon juice and vinegar in a cube and add the honey in at the end. I know that honey loses some of its beneficial properties if heated too much and I wonder if the same holds true if it is frozen? But even if you just froze the lemon juice and apple cider, that would surely expedite your morning routine. Thanks for swinging by today. This is such a great idea and I will have to use it. Thanks for this awesome idea. In the winter, I boil my water and then just pop one in. But they are also very refreshing dropped in a glass of cold water too! And don’t you know, there is no such thing as a silly question! Thanks for asking and hope you have a great weekend.